Intaglio – Glenn Wolffs deft hand with graver and copper plate. Printed on Somerset Velvet paper buff and composed in Baskerville type, mostly in 24 pt size. Paper is 15.25 x 22.5″ and the intaglio plate is 17.5 x 12″. 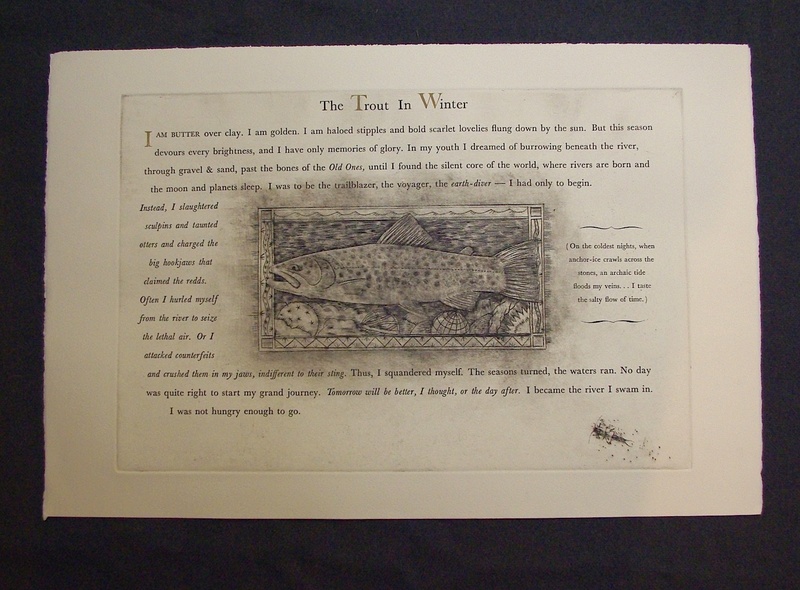 Printed on a 26 x 47″ BAG Intaglio Press and a Vandercook 219 Old Style here at Deep Wood Press. Thanks Sally, I’ll be sure to pass your comment on to the author. This was one of those “magic” projects where 3 friends came together to create with genuine openness to the process. The text is all hand set type and in display sizes (18-24pt) which quickly emptied out a typecase where there are a finite number of each character. In other words – we were out of sorts! The solution was to italicize some of the passages and in some cases to change words completely. The last word of the text was originally “leave” but it was changed to “go” so we could pick up two lower case letter “e”. Needless to say, we had a lot of fun making this piece. Almost as much fun as fishing together. The poem resonates with me. I love the caddis fly(?) on the plate. It’s perfect with the final words, I become the river. I admire your use of the capitals in the title and how you inked them gold. A lovely touch. Thank you for sharing.